It’s hard to imagine that Pixar’s sorcery couldn’t make any project thrive, but such is the case as today we’ve learned that they’ve canceled their upcoming film, Newt. The Pixar Blog reports that they learned from Walt Disney Company archivist Dave Smith (or a representative), that “the film has been canceled.” This wasn’t totally out of left field. Newt was originally slated to hit theaters next summer, but was moved back to 2012 to make room for Cars 2. However, with both Brave (formerly The Bear and the Bow) and Monsters, Inc. 2 set for 2012, Newt mysteriously disappeared from the schedule. And then in February, Disney legend and animation industry insider Floyd Newman said point blank, “Newt is dead.” Looks like he was right. Sadly, Cars 2 lives even though I think the largest success of the first film was in the ability to sell disgusting loads of merchandise. Newt sounded far more interesting. 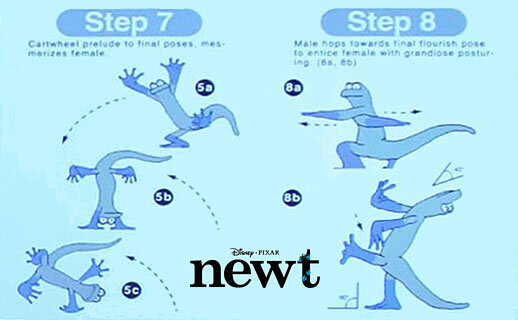 Hit the jump to see what Newt was about as well as concept art from the film. What happens when the last remaining male and female blue-footed newts on the planet are forced together by science to save the species, and they can’t stand each other? That’s the problem facing Newt and Brooke, heroes of “newt,” the Pixar film by seven-time Academy Award(R) winner for sound Gary Rydstrom, and director of Pixar’s Oscar-nominated short, “Lifted.” Newt and Brooke embark on a perilous, unpredictable adventure and discover that finding a mate never goes as planned, even when you only have one choice. Love, it turns out, is not a science.